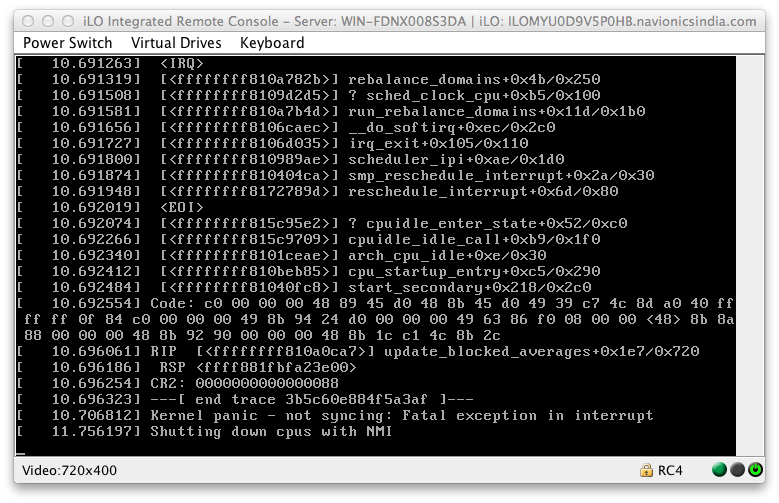 Kernel Panic - not syncing: An NMI occurred, please see the Integrated Management Log for details. global04-jobs2 login: [203930.116834] Kernel panic - not syncing: An NMI occurred, please see the Integrated Management Log for details. [203930.942571] ERST: [Firmware Warn]: Firmware does not respond in time. [203930.983822] ERST: [Firmware Warn]: Firmware does not respond in time. [203931.026586] ERST: [Firmware Warn]: Firmware does not respond in time. [203931.068394] ERST: [Firmware Warn]: Firmware does not respond in time. [203931.110558] ERST: [Firmware Warn]: Firmware does not respond in time. [203931.151923] ERST: [Firmware Warn]: Firmware does not respond in time. Can you take a picture of the panic and attach it to the bug report? Have two servers within 9 days which crashed because of this bug. Both HP DL 380 Gen8 with Ubuntu 14.04 LTS and Kernel 3.13.0-24 generic. We see this or a similar issue on a DL360 G7. As visible in the stack trace, we are using VirtualBox. However, I think this is not related since we used the same version on a earlier Kernel. We also upgraded to latest VirtualBox version after the last crash, however the system crashed again since then. [459191.570170] Kernel panic - not syncinc: An NMI occurred, please see the Integrated Management Log for details. We're not using virtualbox. What I traced back was that it always crashes in two functions. Are newer Ubuntu kernels built with that broken version probably? I installed another kernel yesterday (pf-kernel 3.15-pf4). No crashs anymore. The Kernel installed in our environment is compiled using GCC 4.8.2 (check dmesg | head). Hence I don't think this is related. 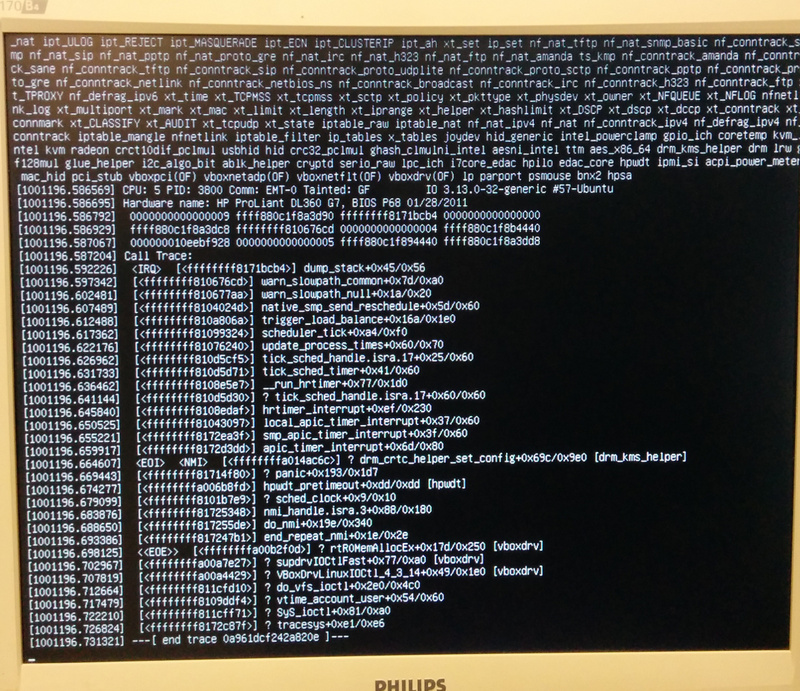 We had the kernel panic again last week (see attachment). We added the hpwdt module to blacklist, which hopefully works around this problem. We also updated the BIOS, but not sure whether this would have solved the problem. Since its a production server, I cannot do any further tests to help solve this problem, sorry. I have an HP Proliant dl380p gen8 with 256 GB of ram. 14.04 Installation works, but after the reboot It crashes at almost every boot attempt. I tried reinstalling it, It started, I upgraded the system to latest kernel available and after the reboot it doesn't boot again, nor with the original nor the latest kernel. Recovery from minima ISO works, but as soon as I boot to the normal system it crashes. I've also tried the recovery mode and init=/bin/bash, and both works until I add some "concurrency" to the system, then it hangs again. Attached there is a screenshot of one of the hang during the early boot. I've already contacted HP and they changed the system main board, we installed the system again and it is still crashing. So this seems to be related to the BIOS/OS CPU powerstate control. Specifically PPC in the BIOS appears to be the issue. Now hilariously this SAME issue occurs on most ANY HP motherboard after a certain date (for instance, my issue is with a workstation). If you have a workstation, go into the BIOS and disable ANYTHING related to power regulation, let it run in turbo mode, if C_states are an option, disable them. This has resolved it for me for 2 days thus far, which is quite an accomplishment with how often it was crashing before. I think that this issue is unrelated to gcc bug linked upthread. Probably the linked kernel have some option that disable/make it working "Processor Clocking Control" or "Collaborative Power Control"
I've tried following the guide on HP site and disabled "Collaborative Power Control" option in BIOS, but the issue with the stock kernel persists. So it isn't the root cause. I've also tried to recompile the kernel disabling CONFIG_X86_PCC_CPUFREQ, but the resulting kernel is still crashing on boot. I've bisected the differences from Ubuntu stock kernel and pf4+ kernel configuration and I've found that the error is triggered by tue CONFIG_SCHED_AUTOGROUP setting. Fortunately it can be disabled at boot time adding the "noautogroup" parameter to grub. With the "noautogroup" the Ubuntu stock kernel 3.13.0-35-generic boots without any problem. I've tried several times. http://kernel.ubuntu.com/~kernel-ppa/mainline/v3.8.13.28-raring/ did fail for me as well. So the problem seems to be introduced between the both versions. I will try now some other 3.8.x to see if it appeared there from beginning. For me this issue occurs also with Intel + Gigabyte Mainboard, so I can't confirm it's HP related only. @Michael -- if 3.7.0 is ok, and 3.8.0 is not the next logical step is to try out the v3.8-rcN candidates out and see which of those introduced it. Shouldn't be faster to git bisect the two releases? If any additional information needed please feel free to ask me about it! Any solution in sight? Otherwise I'd have to change distro and I don't want to. Setting the "noautogroup" option at boot time normally solves the issue. Doesn't it work for you? P.S. The autogroup feature is pretty useless on a server, so it's safe to disable it. "76 CriticalSystem Error03/12/2015 12:4203/12/2015 12:072 An Unrecoverable System Error (NMI) has occurred (System error code 0x0000002B, 0x00000000)"
You are facing a ILO Watchdog NMI meaning that you triggered the ILO watchdog countdown and it has not been updated for sometime. HPWDT triggers the ILO Watchdog countdown whenever /dev/watchdog is opened (like corosync/pacemer do, for example) and ILO will send NMIs after the watchdog has zerod (not updating ILO timer properly, for example). If you ever face NMIs on Proliant Servers for no apparent reason. I just spent the last 6 hours trying to solve this problem on a supermicro machine (mother board is Supermicro X9SRL-F http://www.supermicro.com/products/motherboard/Xeon/C600/X9SRL-F.cfm) before stumbling upon this ticket. Now you know that not only HP machines are concerned. Adding the "noautogroup" by editing GRUB at boot time solved the problem for me. The system is ubuntu 14.04.2 with a 3.13.0-53 though I experienced the issue with previous 3.13.0 kernels from the original installation of the server back in September 2014. Note that even if I am on 14.04.2, I don't use the newest LTS kernel stack (https://wiki.ubuntu.com/Kernel/LTSEnablementStack) from 14.04.2 (it means that I installed from a 14.04.1 media, the mini.iso to be exact, then upgraded). I thought I was going crazy: during those 6 hours trying to fix the bug, I eventually ended up doing a fresh install (with the mini.iso though, which means that I got all last upgrades, including newer 3.13 kernel), but the problem was still there. I seriously hope this will be fixed! Good to know you are able to reproduce this behaviour and that you found a workaround. When you say "noautogroup" fixed the "problem".. was you problem kernel panics due to NMIs ? Could you share stack trace and/or kernel panic output so I can take a look ? Are you using Intel 26xx v2 CPU series ? Do you mind providing me a sosreport ? Can you check if this behaviour happens with 3.16 and/or 3.19 kernel also ? Also, if possible, could you follow "http://www.inaddy.org/mini-howtos/dumps/using-ubuntu-crash-dump-with-kdump" instructions, enabling kdump, and send me the core dump from /var/crash ? It looks like there are 2 bugs being commented on this case.